Ceratogaulus, a Miocene rodent known only from the Great Plains of North America, is the only known rodent ever to have horns. This feature is all the more unusual given that it occurs in a fossorial (burrowing) animal. 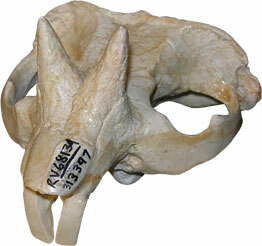 These horns have puzzled paleontologists since their first description by W.D. Matthew roughly 100 years ago. Their presence (and extraordinary size, in the latest-occurring members of the genus) seems incompatible with life in the constrained space of a burrow. Samantha Hopkins' research into the evolutionary history and functional morphology of these structures indicates that the best explanation for their appearance is as a defensive adaptation to deter predation as their larger body size forced them to spend more time above ground.